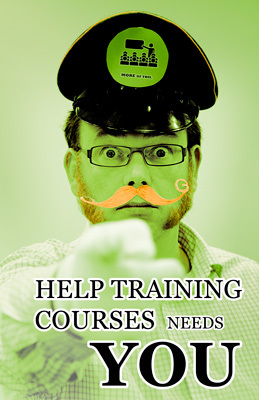 I’ve spent a fair bit of my time recently working on training course portal HelpTrainingCourses.com. Mostly this has been technical web build work, such as setting up the mechanisms to automate the travel industry style last minute deals that the site brings to spare training course places. There’s still been plenty of scope for some fun photography work too though, such as this impromptu poster campaign featuring Help’s Sales Director to use in a social media ad campaign for summer work placements. The recolouring work for the shot was done with a very quick technique in Photoshop CS4, overlaying one of the standard company colour palates of green, black, white and orange in four separate layers over the original. The layers were masked using selections created via the Select -> Colour Range option to to give a stylised effect and then the opacity of the top couple of layers was fine tuned a little. As a photographer it’s good to see some deals on photography training courses appearing on the Help Training Courses website and there are some particularly good ones at the time of writing, such as 50% off Photoshop Training and ‘Introduction to Digital Photography’, both of which are aimed at helping beginners get started. The easiest way to find what you’re looking for is to use the find a training course option on the home page but there’s a dedicated photography training page too.